Venezuelan exiles and supporters take part in a protest today, Thursday, June 1, 2017, in front of Goldman Sachs offices in Miami (USA). 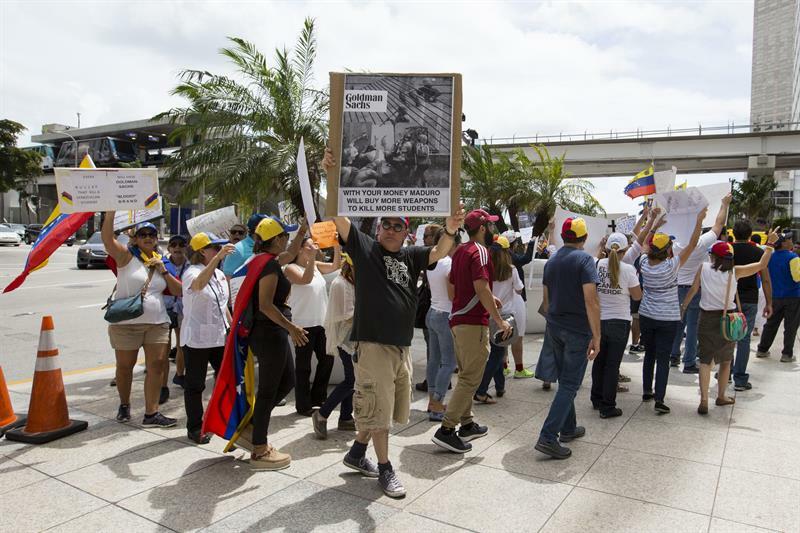 Members of Venezuelan exile gathered outside the offices of Goldman Sachs in Miami today to protest a major purchase of Venezuelan bonds that in his opinion gives “oxygen” to the government of Nicolás Maduro. Half a hundred exiles summoned by Venezuelans persecuted in exile (Veppex) shouted slogans in English and Spanish in the vicinity of the financial building in repudiation of the purchase of bonds from state oil company PDVSA. “We reject the purchase for 860 million dollars, which constitute oxygen for a regime that is violating human rights and that if we do not have these help we would have very little time left in power,” José Antonio Colina, president of Veppex . Colina said it is disconcerting that a US firm indirectly supports the Maduro regime in “challenge” to the positions of the United States Government. “The United States in recent months has said that this is a narco-government, which is a regime that is violating human rights, which violates the Constitution, which have cartels operating within institutions,” added the activist. Demonstrators also showed support for youths who are protesting in Venezuela, and at the same time the fear that they will leave the streets due to repression. “With his money (that of Goldman Sachs) Maduro will buy more weapons to kill more students,” said a banner at the doors of the firm. Claudia Angrisano, one of the protesters, called on the international community to “pay attention to Venezuela”, while the group asked Venezuelans residing abroad to repeat these protests against the Goldman Sachs firm wherever they are. Venezuela has been plunged since April 1 in a wave of protests in rejection of a decision of the TSJ to assume the functions of Parliament, controlled by the opposition, a measure that although reversed in part, opened a political crisis that Maduro seeks to conjure up with A Constituent Assembly. The Venezuelans today repudiated in Miami that the financier supports with the transaction the plans of Maduro, who has called for elections to said Constituent Assembly in late July. “The dictatorship has 51 days left, either to go, but if Venezuela is constituted the Constituent will have lost the battle, the deaths will have been in vain,” said Colina. On Tuesday, the opposition National Assembly of Venezuela (AN) agreed to investigate the purchase of part of Goldman Sachs of bonds for a total of 2.8 billion dollars.